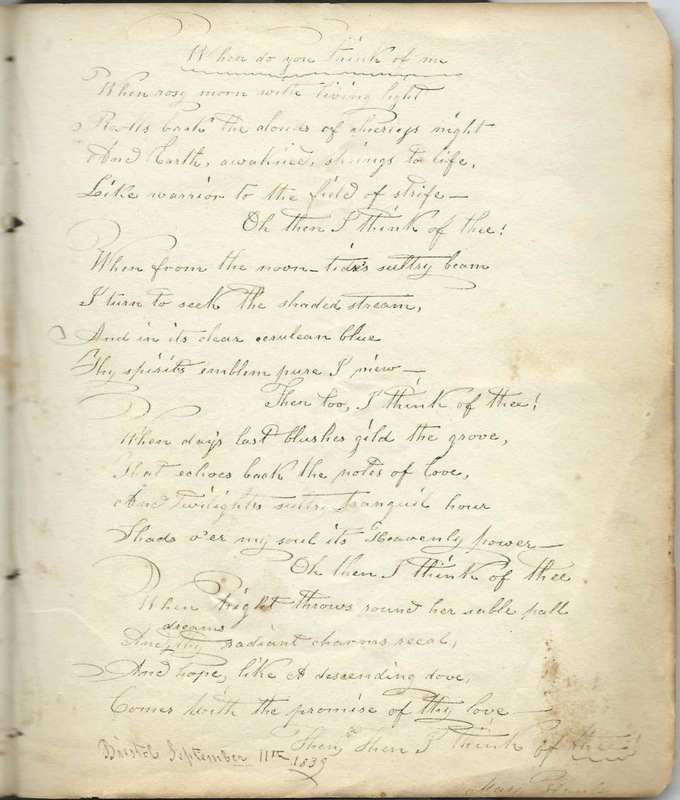 Autograph album started in 1839 by Felicitas Hanly of Bristol, Maine, and kept up after her marriage to John Rafter, an immigrant from County Wexford, Ireland. 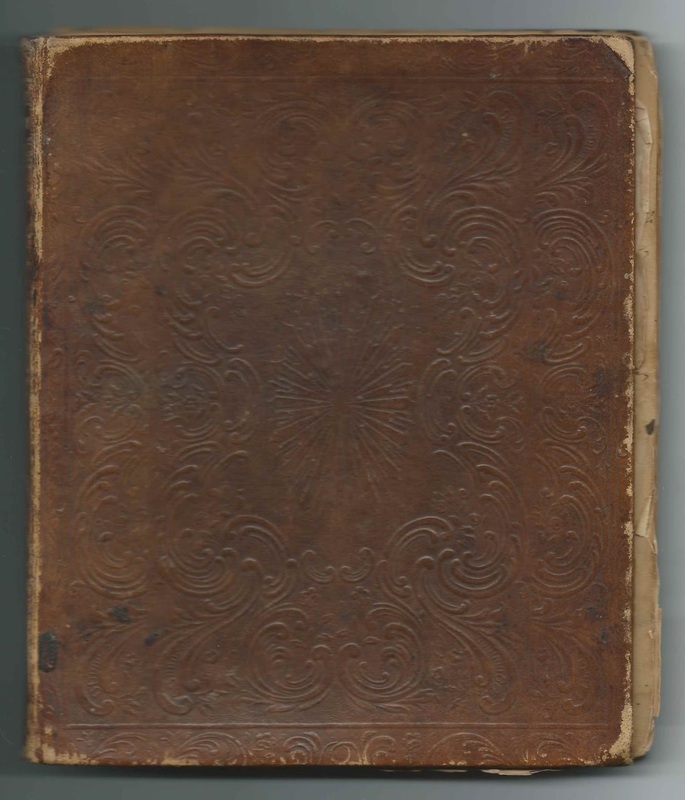 The album, published by J. C. Riker of New York, measures approximately 7-1/2" x 6-1/4" and contains the sentiments of possibly as many as 30 people, though some may have inscribed more than one page. 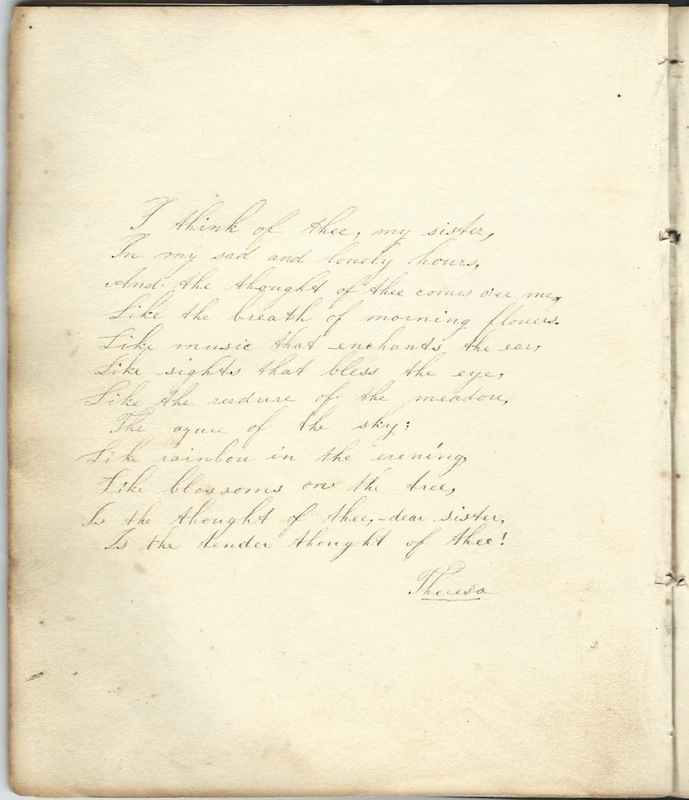 The album contains four engravings, though three of them are small, with most of the page left for a sentiment to be written, as below, inscribed by an unnamed admirer at Nobleboro, Maine, on September 4, 1840. Most of the signers came from the Hanly family. I've noticed variant spellings of Hanly online, even in some records, but only the spelling "Hanly" appears in this album. Felicitas Hanly was born December 18, 1818 at Bristol, Maine, the daughter of Roger Hanly, Jr., and Mary (FitzGerald) Hanly. Felicitas' parents both inscribed pages in her album. Mary may have inscribed more than one page. 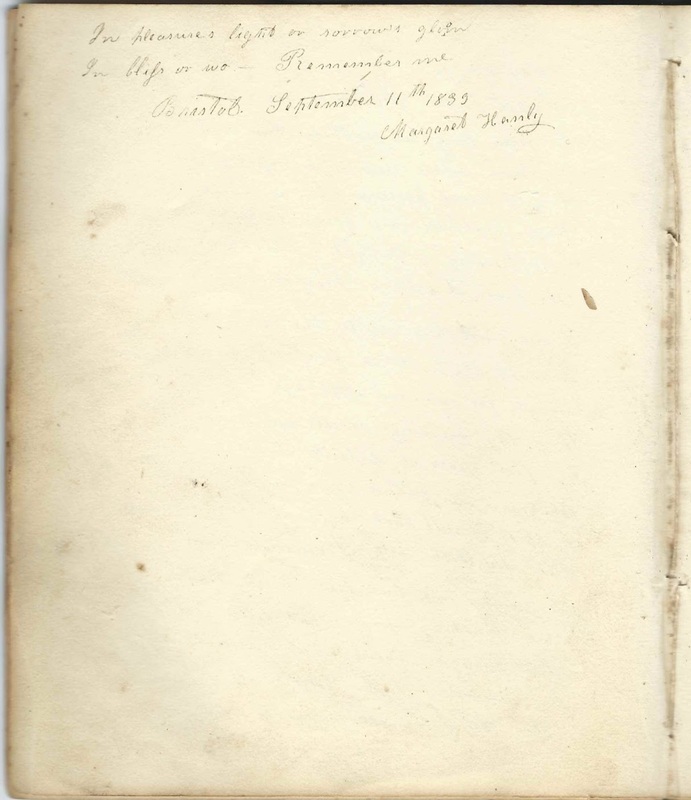 The Margaret Hanly of Bristol, Maine, who inscribed a two-page sentiment on September 11, 1839, may have been Felicitas' paternal grandmother, Margaret (Erskine) Hanly. At some point in 1839 or not long after, Felicitas Hanly married John Rafter, an immigrant from County Wexford, Ireland, who worked as a ship carpenter. They had a son John B. Rafter, sometimes seen as John B. Rafter, Jr., so it's possible that Felicitas' husband was John B. Rafter, but I'm not quite ready to jump to that conclusion. Felicitas and John settled at Damariscotta, Maine, and raised at least nine children, though I don't know if they all lived to adulthood. Two of them inscribed pages in the album, and there may have been more who signed with just a first name, so I couldn't be sure who they were. James E. Rafter wrote his name on the first end paper on October 6, 1867. 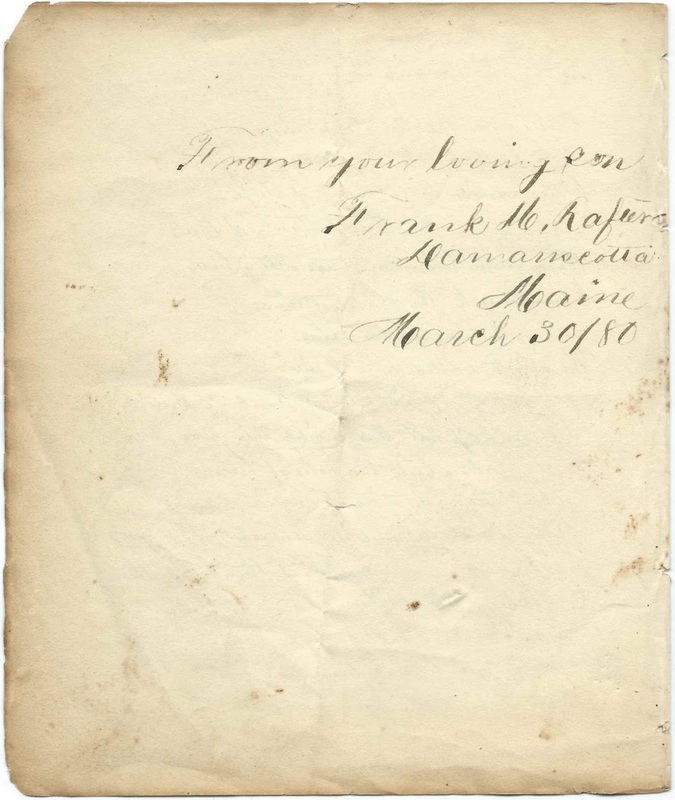 Francis M. Rafter, "Frank", of Damariscotta, Maine, inscribed a page on March 30, 1880. John Rafter died in 1872, and Felicitas in 1907. After John died, Felicitas lived with son Frank, whose page is shown above, and his wife Winnifred (Kavanagh) Rafter. 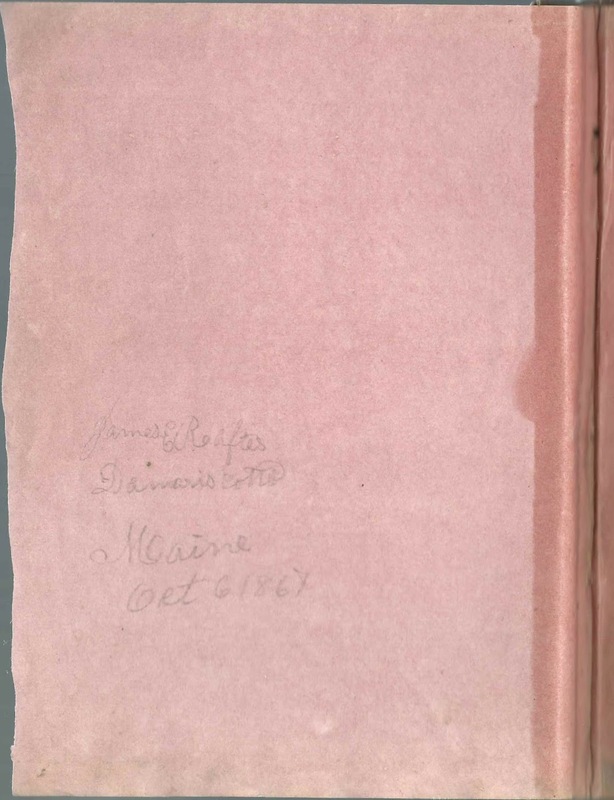 There are two pages signed by a Theresa, possibly the same person, on one of which she refers to Felicitas as a sister. Whether this is a sister by blood, marriage or social or religious affiliation, I don't know, but hopefully a reader will have an insight. Please refer to the list of signers below for the names of more members of the Hanly family, including who I think are Roger Hanly, Jr., Felicitas' brother, and her paternal uncle John Hanly. An Annie Rafter also signed a page, with a middle initial possibly an F or an S. John Rafter reportedly had a sister named Annie. There's an Ann B. Rafter buried with Michael and Bridget Rafter at Jefferson, Maine. If that Ann is John's sister, then she is not the person who inscribed the page. Mary. There's another word that could be her surname or her town. Looks like Lurmer. Theresa; calls herself Felicitas' sister - whether by blood, marriage, or social or religious affiliation. Theresa; possibly the same Theresa who inscribed another page. A. S. H., signed at Bristol, Maine, on June 19, 1840. First initial looks like Arm or Am. Eliza S. of Bristol Mills, Maine; inscribed to Miss Hanly, apparently just before her marriage to John B. Rafter. Mary Drummond; written to Felicitas as she was about to marry John R. Rafter. 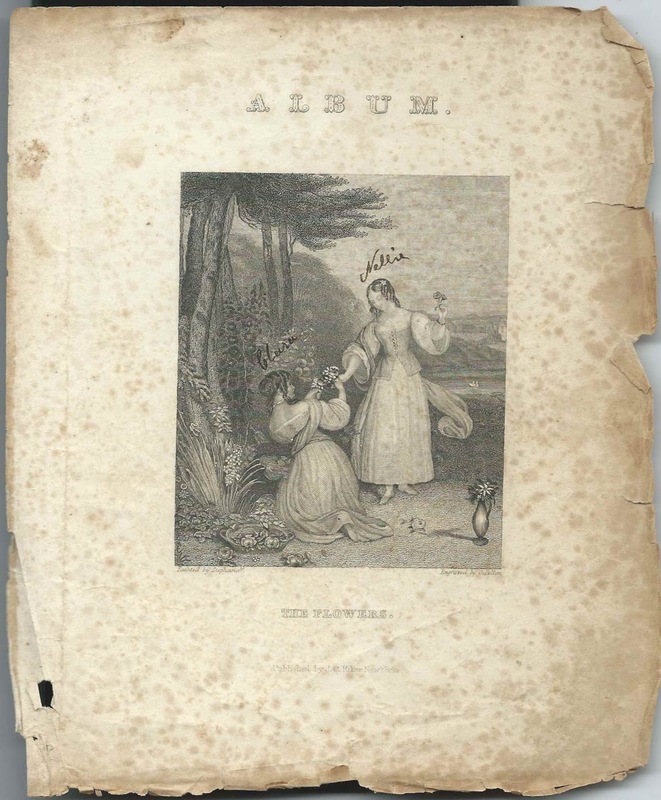 Felicitas Hanly of Bristol, Maine - her autograph album started in 1839, just before her marriage to John B. Rafter, and after. It may have been she who wrote her name on the inside back cover as Mrs. Felicitas Hanly. 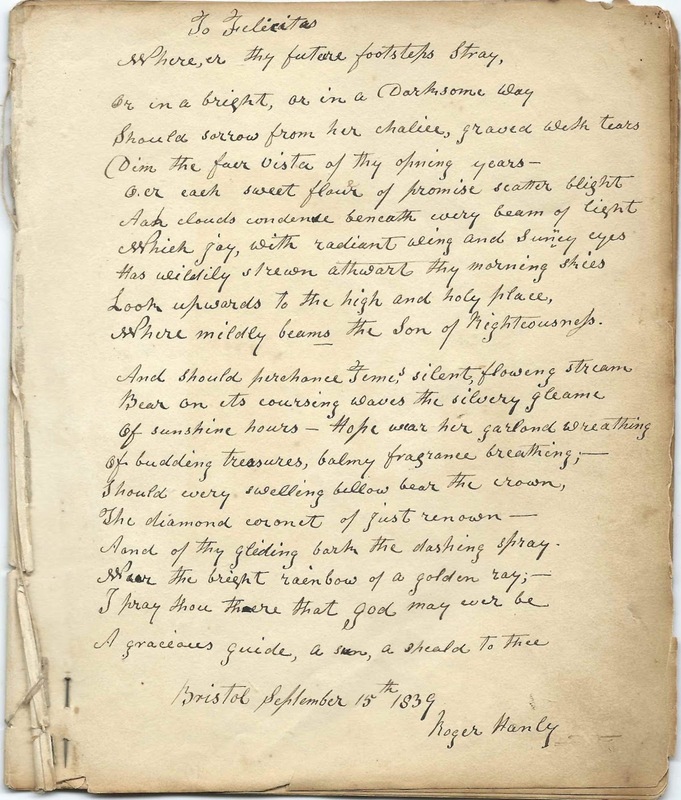 Mary Hanly, signed at Bristol, Maine, on September 11, 1839. Presumably Mary (Fitzgerald) Hanly, wife of Roger Hanly, Esq., and mother of Felicitas (Hanly) Rafter. John Hanly, signed at Bristol, Maine, on August 12, 1843. Presumably the John Hanley (1786-1846) who was the paternal uncle of Felicitas (Hanly) Rafter. R. H., Jr., signed at Bristol Mills, Maine, on August 18, 1839; presumably Roger Hanly, Jr., Felicitas' brother. 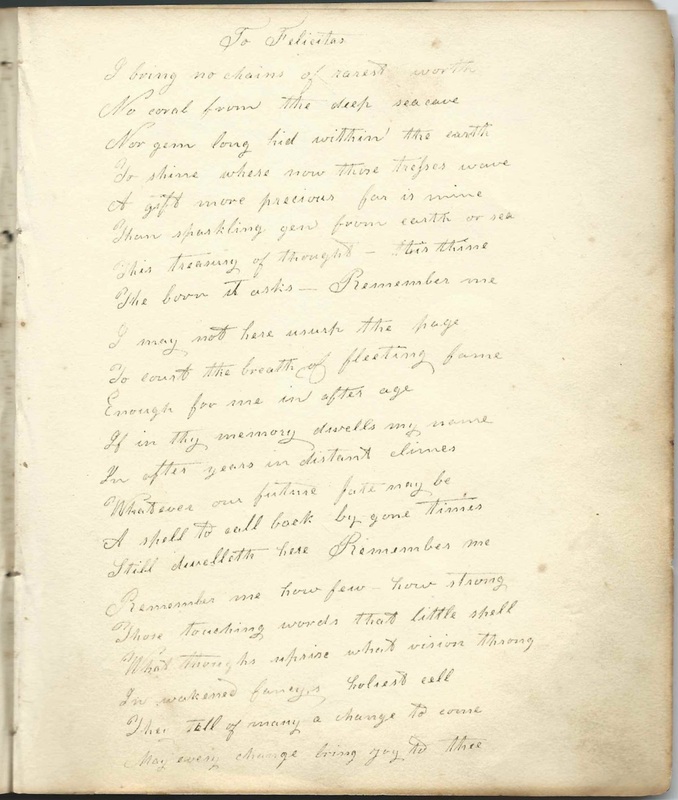 2 page sentiment inscribed by Margaret Hanly, signed at Bristol, Maine, on September 11, 1833. Presumably Margaret (Erskine) Hanly, Felicitas' paternal grandmother. M. Hanly, signed at Bristol, Maine, on May 15, 1842; inscribed to "Mrs. Rafter"
Margaret Hanly, inscribed at Bristol, Maine, on August 12 [no year written]. Possibly Felicitas' paternal grandmother Margaret (Erskine) Hanly. Written on first end paper, upside down: "James E. Rafter, Damariscotta, Maine, Oct. 6, 1867" Son of album owner Felicitas (Hanly) Rafter. "From your loving son, Frank M. Rafter, Damariscotta, Maine, signed on March 30, 1880"
Annie Rafter; middle initial looks like an F or an S or ?